Our english diving center Hurghada offers diving in hurghada for every level for the best prices. Choose from what you want: diving course, discover scuba diving, daily diving, special courses, snorkeling trips and more. Courses will be done for PADI or CMAS certification. Hurghada is one of the best and most important diving location in the world, with a diversity of corals, colorful fishes and intact reefs. Many divers prefer to dive in Hurghada for many reasons. The diving prices are lower than other spots in the world. In our english diving center Hurghada you can dive or complete a diving course for a appropriately price. Our diving center Hurghada will offer you the best price in the Hurghada area. In Hurghada diving you will find a beautiful underwater world with coral reefs, pleasant water temperature and a good view from 10m to 20 m or even more. These are also very good reasons to learn diving in our diving center Hurghada. Of course you can take your certification all arround the world, even in lakes, but isn ́t better to learn diving or improving your diving skill in the Red Sea? Hurghada diving Center offers you many options for diving in Hurghada and enjoying the Red Sea. If you want to learn diving in Hurghada you can do a diving course with our diving center in Hurghada and be certified with PADI or CMAS. Here in Hurghada you will have many possibilities to gain expierence, continue your diving skill with speacalitys and having a lot of fun during your holiday. The fun of diving will come already when you decide to start a diving course with hurghada diving, you will watch videos and read a book for getting some information about diving, which you will get from our english scuba diving center Hurghada. Our english diving center Hurghada will teach you why a boat stays on surface and why a small screw will sink. You will learn about buoyancy and movement underwater. After you will start to get underwater and in shortly time you will continue your course while a daily boat trip. You will discover the colorful underwaterworld here in Hurghada with corals, fishes and you will see the world from a different perspective. 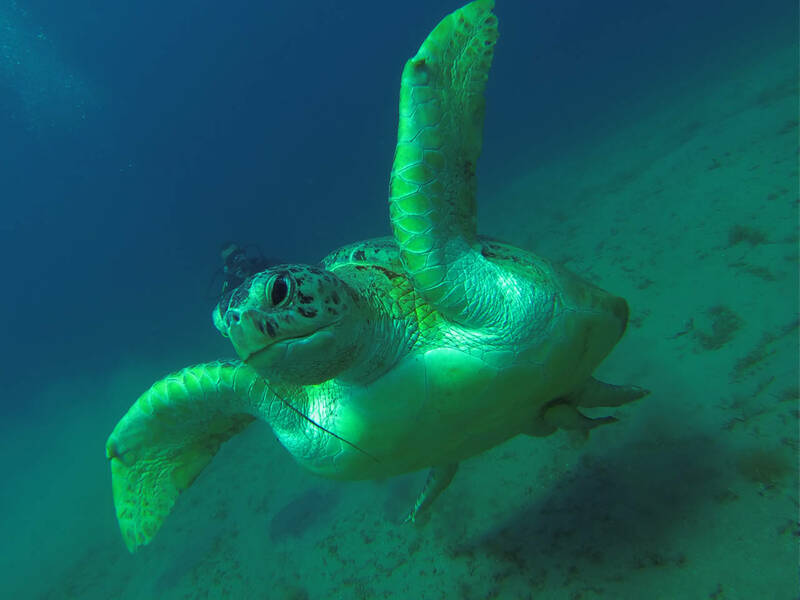 With Hurghada diving you will feel immediatly the difference between underwater and surface, when you get this feeling you will see how much fun and enjoyment is diving in Hurghada. This is only a brief information and introduction about diving in Hurghada and about our english diving center in Hurghada. More expierence, information and as well the enjoyment and fun of diving you will get with our scuba diving center in Hurghada. Boat trips in Hurghada are ranging from daily excursions for scuba diving to recreational acitivities like snorkeling. 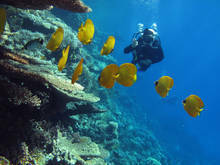 Hurghada Diving offers a lot of dive sites and coral reefs. Daily trips are starting from 9.00 and end around 17.00. Snorkeling means swimming with mask, snorkel and fins and watching the beautiful underwaterworld with corals and colorfull fishes from surface in 3 to 4 differnt spots. After snorkeling, we will drive to Giftun Island with sandy beach to relax. Diving trips for all who are interested in Discover Scuba Diving or already certified divers consist of two differnt dive sites. The first dive of our daily trip takes place arround 10.00. After completing this dive, relax on the boat, enjoying egyptian sun and having a fresh prepaired delicious lunch. After the break the boat from diving Hurghada will bring you to the second dive site. On the way back to marina you will have again time to relax and enjoy your trip with Diving Hurghada. The transfer from your hotel and back is guaranteed by us, diving hurghada. Diving safaris, called Live Aboard, taken place in the north or south of the Red Sea and are for certified divers. You will stay one week on the boat, sleeping, eating and of course diving. A diving day on this consist for three to four dives on different dive sites. Early morning dive, two dive during the day and a night dive. There is possilitiy for deep dive, wreck dives or even diving with sharks. If you interest in diving safari feel free to contact us, Hurghada Diving, for more information. If you decide to make a diving course and get a diving certification or continue on with specialtys during your holiday in Hurghada, our english Scuba diving center in Hurghada offers you a lot of possibilities by PADI or CMAS. You will see....diving with us, diving hurghada, is fun! The Open water Diver course (OWD) is the first step to become a diver. 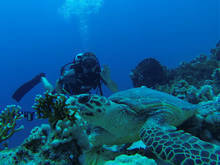 The program can be completed in four days with diving Hurghada. Watching DVD, some theory and diving exercises in the swimming pool or shallow water at the first day, the other days you will join on the boat with a daily trip. Another option for OWD is to start the first day from the boat with an introduction dive. The DVD you can watch relaxed at the evening in your hotel (think about to bring your computer with you) or watch it during the trip on the boat. The following days you will be on the boat as well to continue your OWD course. The maximum depth is 18 meters. The necessary theory book for your OWD course you will get from our Scuba Diving Center Hurghada at the first day. 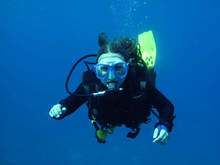 The Open Water Diving Course with us, diving Hurghada, lasts 4 days with 7 - 8 dives in total. Prerequisite for an Advanced Open Water Diver course (AOWD) is your OWD certificate or euquivalent. The AOWD offers the possibility to get more diving experience under supervision of an diving instructor, increase your self confidence underwater, learn new skills and knowledge about diving like deep diving, navigation, wreck diving or night diving. Here the maximum depth is 30 meters. You will spend 2 days with us, diving in Hurghada, and you will need 5 dives for the AOWD. The Emergency First Response Training focuses on creating trust in laypersons and increasing their willingness to respond in the event of a medical emergency. Students will easily learn to follow emergency care steps and practice their skills in a non-stressful learning environment. All courses are supported by self-paced manuals and videos to enhance learning and enable you to take this course with us at our diving school in Hurghada. Scuba divers call the Rescue Diver TAuching Course in Hurghada the most challenging but rewarding course they have ever completed. you will learn to avoid and manage problems in the water and gain more confidence in your abilities as a diver, if you know that you can help others when needed. The Diving course teaches you to become a better buddy by practicing problem-solving skills in the event of a danger or accident in or under water. The course is serious, you learn a lot but because the fun is not too short. Would you like to share it with others on a whole new level? Join the Divemaster Dive Course and do what you love as a career. Divers look up to divemasters because they are leaders that motivate and motivate others. As a Divemaster you can not only dive a lot, but also experience the joy that others have as much fun diving as you. 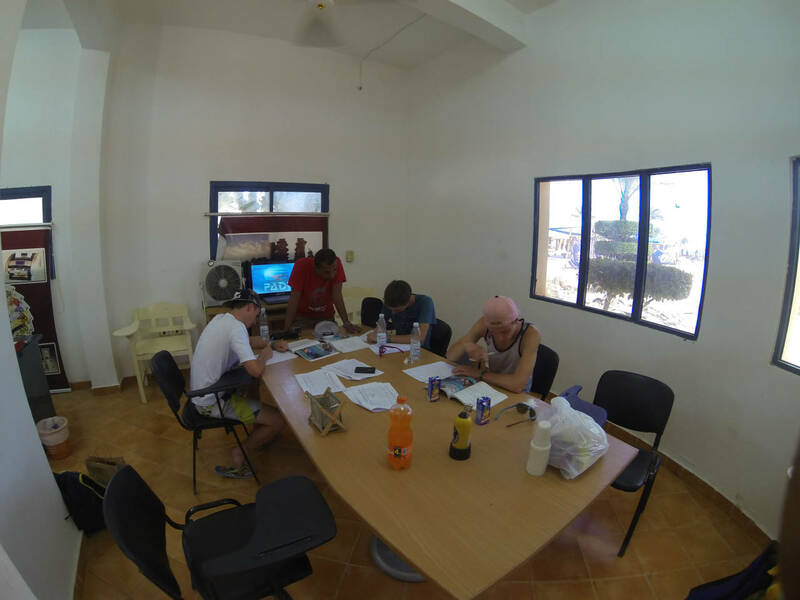 The Divemaster course in Hurghada is your first level of professional education. Working closely with an instructor, you'll refine your diving skills, such as perfecting effortless hovering, and refining your rescue skills so you can tackle common problems and solve them easily. Diving skills, management and supervision skills are acquired to be a role model for divers everywhere. As a divemaster, guide others as you supervise diving activities and help with diving training. Whether you want to work at a distant dive destination or stay at a local dive shop nearby, the adventure of a lifetime awaits. 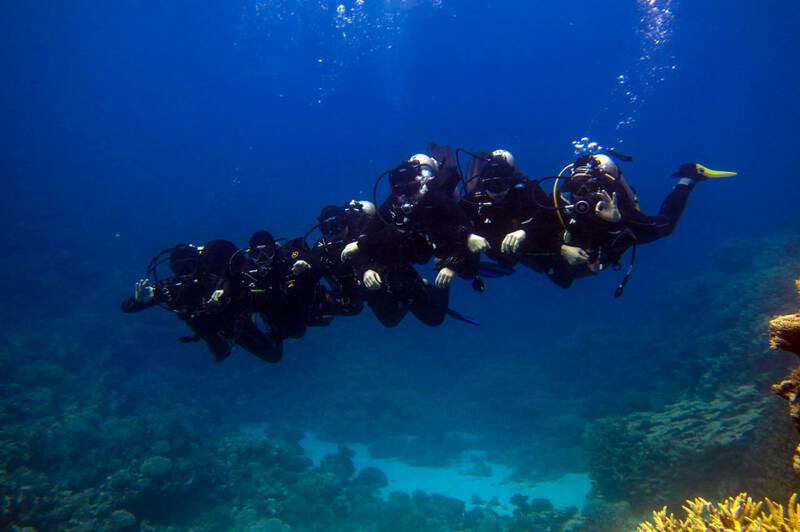 The PADI Nitrox Dive Course in Hurghada is a very popular diving course. The enriched air diving nitrox means a longer decompression time, especially for dives that are repetitive. If you stay down longer and go faster into the water, that sounds appealing, then do not hesitate to become a Nitrox diver. The course lasts one day. Usually it's just theory lesson with the exam. Our guests are allowed to dive 2 dives with Nitrox at no extra charge. The lure of the depth. It is exciting and mysterious to explore deeper dive sites while diving. Sometimes it is a wreck that attracts you below 18 meters, or it can be a huge fan or sponge on a wall dive. Whatever it is, if you want to dive safely down to depths of 40 meters, you should take the PADI Deep Diver Specialty course. If you have achieved the PADI Adventure Diver certification or higher and are at least 15 years old, you can register for the Deep Diver course in Hurghada. Whether sunk as an artificial reef for divers or as a result of an accident wrecks are fascinating windows into the past. Ships, planes and even cars are fascinating to explore and are mostly shaped by aquatic life. Every wreck dive offers the opportunity to discover, uncover a secret, or spy on something others have overlooked. 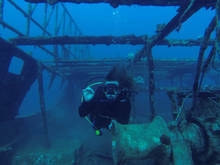 The PADI Wreck Dive Course is popular because it offers rewarding adventures while watching responsible wreck diving practices. If you are at least 15 years old and have obtained a PADI Adventure Diver certificate or higher, you can enroll in the Wreck Diver Specialty Course in Hurghada. 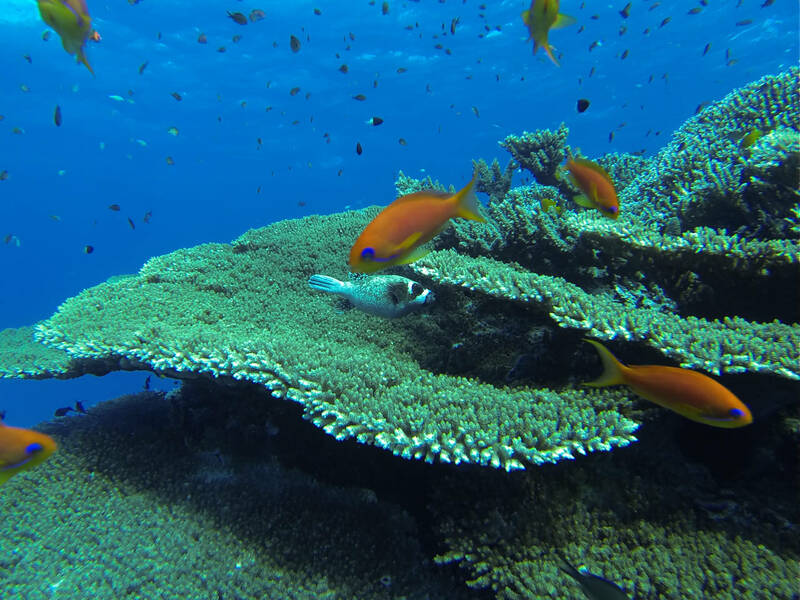 Snorkeling trip with our Scuba Diving Center Hurghada – Because some divers want to spend their holidays together with family members not diving we offer a snorkel trip on the boat for non-divers. 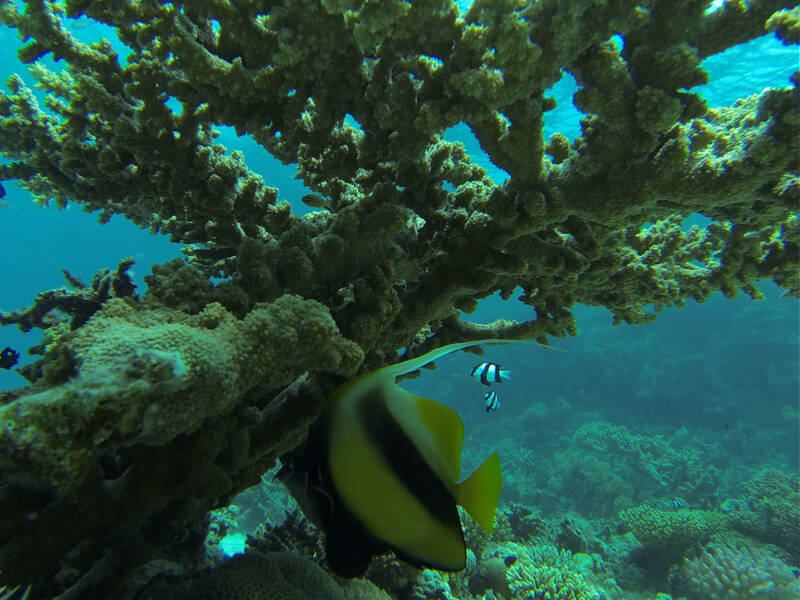 You can come with us on our daily trips and explore the beautiful underwaterworld of the Red Sea with your mask, snorkel and fins. For all non-swimmer are live jackets on our boat. 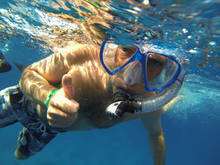 One of Hurghadas best known daily trip is snorkeling to Giftun Island. Our Snorkel excursion starts between 8.30 and 9.30 in the morning .Our guide from diving Center in Hurghada will give you a boat briefing and explain you the schedule of the day. The program includes two differnt coral reefs for snorkeling. You will learn how to use your mask, snorkel and fins, we will give you some introduction for marine life and we jump into the water and look at colorfull corals, fishes and an impressiv underwaterworld. Of course our english Diving center in Hurghada offers life jackets for all non-swimmers. Our lunch will take place after the first snorkel excursion on the boat. After we start to the Giftun Island, small boats will bring us to the beach of Giftun Island and we will spend arround 1 to 1,5 hour there on this beautiful sand beach. This time could be used to enjoy egyptain sun, taking pictures, have a drink at the cozy bar (drinks at the bar will be charged, no toilet on the island) or only to relax and enjoying your holiday. After the boats will pick us up and we will go back to marina in Hurghada arround 4 pm and 5 pm. Our english diving center in Hurghada offers you scuba diving Hurghada if you have never dived before and would like to see the underwaterworld and get a new expierence. Intro diving in our scuba diving Center, Hurghada diving is the perfect opportunity to look into another world. Get first expierence with dealing with diving equipment, breathing underwater and the feeling of hurghada diving. Together with our diving instructors you will explore the underwaterworld and see how much fun diving in Hurghada is. Our Scuba diving center Hurghada offers two introduction dives in two differnt dive sites during our daily trips with diving Hurghada. You will love it! An Introduction diving course in our english Diving Center Hurghada takes one day and is nearly the same like introduction diving. 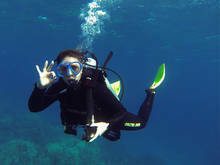 Differnce is you will get more diving expierence, doing some exercises under the water like clear your mask, take out the regulator and some buoyancy skills. In addition you will learn how to prepare your diving equipment. 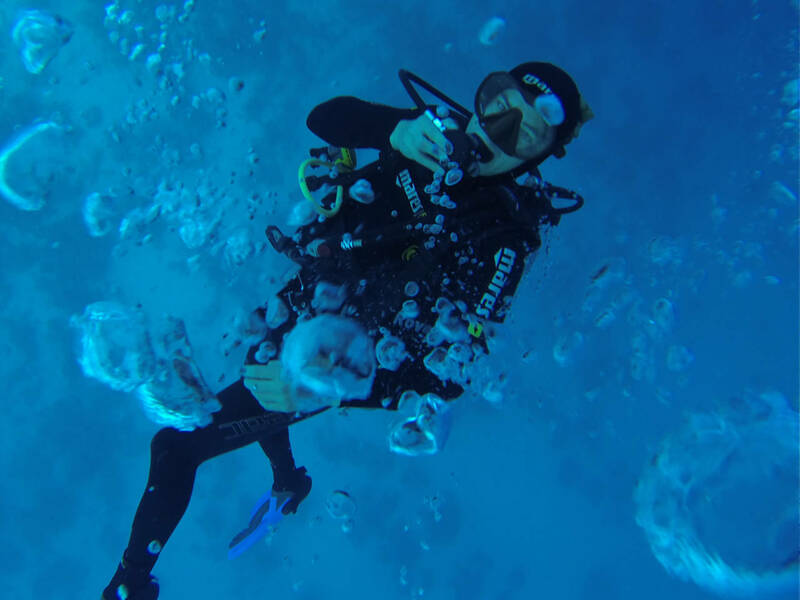 For this Introduction diving course in Hurghada you will get a Discover Scuba diving certification and if you like to continue on with OWD course the first step already done. The maximum depth here is 8 to 10 meters. Special Diving Hurghada means diving for all certified divers from Open Water Diver till Instructor.We will go dive special places together, differnt kind of dives like wreck diving, deep dives, drift diving or pick up dives. If you interested in night dives do not hesitate to contact us.....we, hurghada daiving, will organize for you. Dolphins feel comfortable in warm water, so most of the time we will find this amazing animals at the Dolphin house in Hurghada. 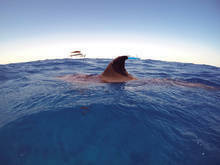 This destination is very popular for divers and snorkelers. 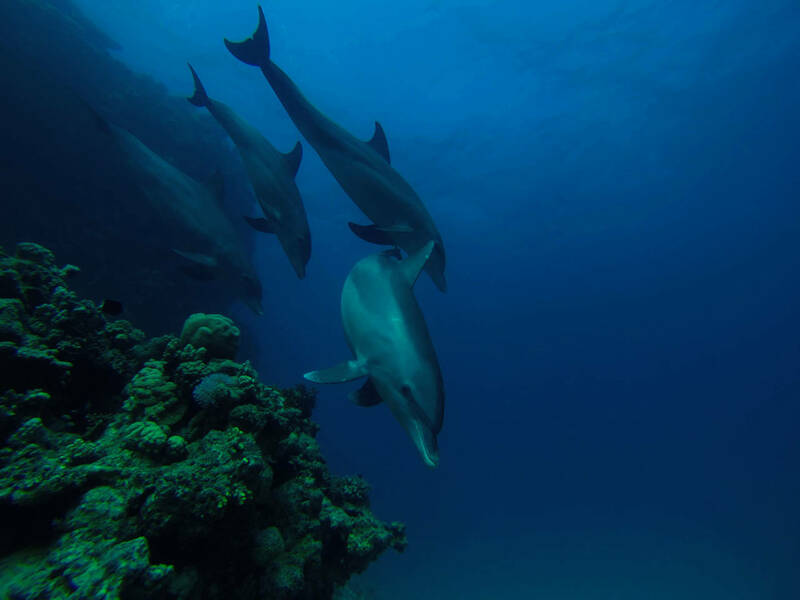 Our diving center in Hurghada start our day trip to the Dolphin house Hurghada earlier than other excursions because it is located like 90 minutes from our diving center Hurghada. 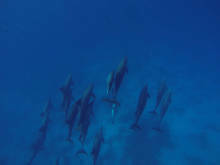 On the way are several places where dolphins like to stay. 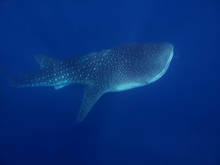 If we will meet them on the way of course we stop the boat and swim together with this fabulous animals. At the Dolphin house Hurghada we will spend more time to join the dolphins. After our lunch we will change the dive site and observe the underwaterworld of the Red Sea with all the differnt corals and fishes. Between 16.00 and 17.00 we will be back from your trip with Hurghada diving. Transfer like always be done by our Diving Center Hurghda. 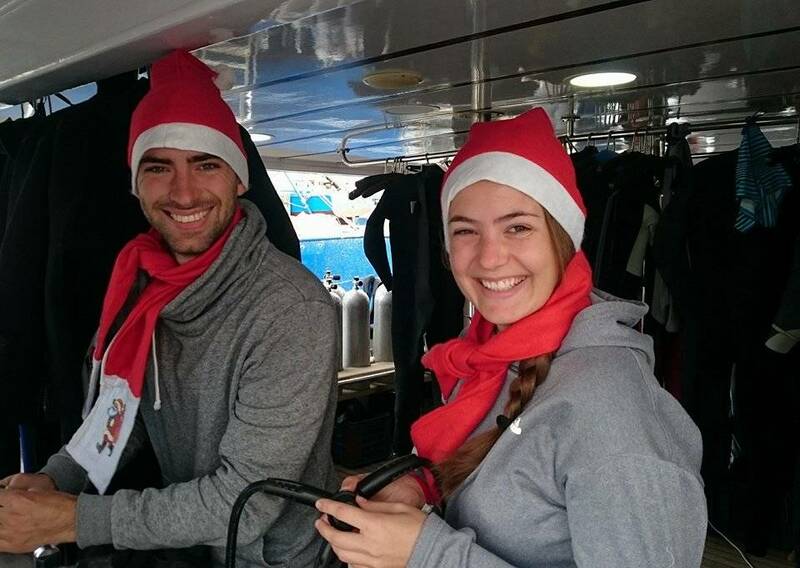 Enjoy your holiday together with us - Divers Hurghada! 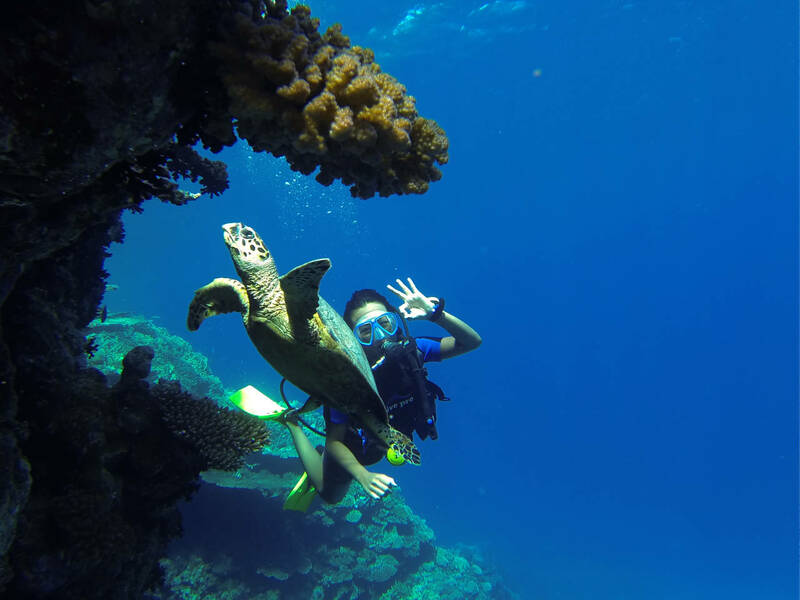 Hurghada Diving is offering also privat boat trips for diving or snorkeling if you prefer to enjoy some privacy together with your familiy or friends. The beauty of Red Sea will fascinate you. You choose how to schedule your day on the boat, diving, snorkeling, visit Giftun Island or even swimming with dolphins in Hurghada. Just contact us - diving hurghada!